A cost of $2000, it is necessary to add the shipping costs, the food and the customs charges, about $2700 in total. A computing power of 10000 H/s corresponds to about 33 Nvidia GTX 1060 except that the price for 33 nvidia GTX 1060 is much higher than $2700 and the total consumption much higher than 300w. Here is a screenshot took on a mining pool regarding the crypto-monnaie ZelCash: 3.8 million of soil, equivalent to 12633 Nvidia GTX 1060 and an approximate income slightly less than $1000 per hour when writing its lines. It is also possible according to the creator of the ZelCash that this address is simply the one used by NiceHash. If these are ASICs it is obvious that this one can destroy the mining via GPUs Nvidia on the Cryptos-currencies of the algorithm Equihash. 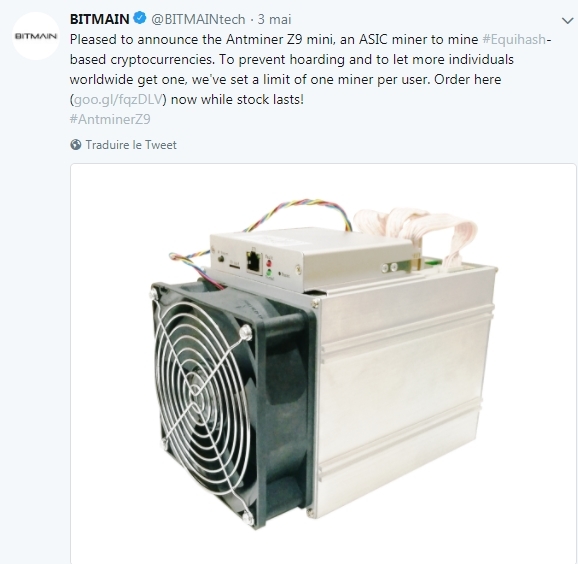 Good to know: Bitmain which is above all a company to make profits mine already for probably several months with this ASIC Antminer Z9 Mini and decides to sell it because they are already in preparation for a new ASIC. They have amassed a lot of money because they have the advantage of being able to undermine with enormous computing power before anyone else, so the sale comes from the material that has already been used by Bitmain. Shortly after the announcement of Bitmain, Cryptos-currencies creators/developers using the Equihash algorithm responded. Some have let the community choose, others are categorical and refuse to let Bitmain "eat" all the crypt-currencies of the algorithms one by one and refuse centralization. The crypto-Monnaie BitcoinGold was the first crypto-currency to want to perform a fork to counter centralization. Soft fork = Changing the code to make it resistant ASIC again, the algorithm does not change. Hard fork = code modification, algorithm change, ASIC resistant, two strings are created. Zcash let the community discuss it but one of the members said: "This fight has no chance to be won". Let's not forget that Zcash has a 20% reward on each block that is mined, so it can be inferred that no matter where the computing power comes from to extract the blocks. Zcash does not care about centralization or decentralisation, it may change before July, especially if the community makes a little ' forcing '. ZenCash let the community discuss it, but they are for decentralization. BitcoinGold will perform an algorithm change, the Zhash in order to be again resistant ASIC. BitcoinZ will perform an algorithm change, the Zhash in order to be again resistant ASIC. BitcoinPrivate lets his community discuss it, one of the members (Giuseppe Stuto) to declare to be against ASIC and be for decentralization. ZelCash will perform an algorithm change, the Zhash in order to be again resistant ASIC. SafeCoin will perform an algorithm change, the Zhash in order to be again resistant ASIC. For the moment, other cryptos-currencies have not communicated about this but it seems that Zcash is the only crypto-currency of the algorithm Equihash not want to perform fork and the other yes except those that have absolutely nothing communicated about it ( Snowgem, Komodo, Hush). According to the first news, it seems that the Antminer Z9 Mini starts badly, this one has an important chance to be obsolete upon receipt of the material. Concerning us, it is not yet the end of the mining via GPU on the algorithm Equihash, on the other hand we do not know the future and ASIC will certainly win the fight one day and it is necessary to adapt unless new algorithms are born as the case could Be spotted recently with the X16 algorithm (X16R/X16S) which uses 16 different algorithms during mining. 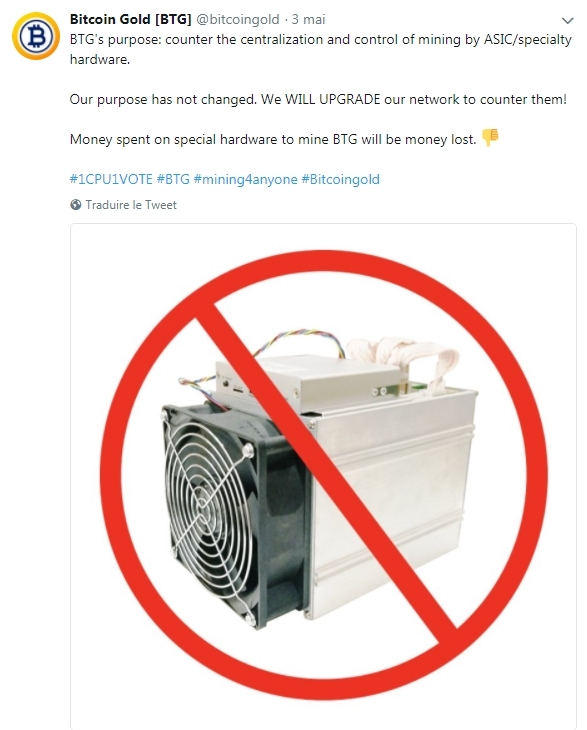 Small reminder: The Antminer X3 which allows to undermine cryptos-currencies used by the algorithm Cryptonight was a big flop because me decided to make a fork and change its algorithm which is now the CryptonightV7. The Antminer E3 which allows to undermine crypts-currencies used by the algorithm Ethash/Dagger-Hashimoto is not a great threat, no fork was necessary, it is a "small" ASIC. On the other hand, this ASIC for Equihash is a big threat and we will see what the creators of Cryptos-currencies will decide even if there is a good chance that this ASIC is obsolete upon receipt. If you have any questions, if you think it is missing something important to add or correct do not hesitate to write a comment.